If you want to know how to make your dog a service dog or how to register your dog as a service dog or ESA, then the information we have below will help you. If your pet is any species other than a dog, it won't qualify as a Service Dog (only dogs and miniature horses may legally qualify as service dogs). 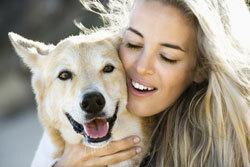 In this case, registering your pet as an Emotional Support Animal (ESA) is your best option. In a minute or two, you'll be able to identify which service type you qualify for, and will know the steps for how to make your dog a service dog. An Emotional Support Animal (ESA) requires NO training and can be any normal domestic pet (dog, cat, rabbit, bird, lizard, fish, etc.). The presence of the ESA is what minimizes the negative effects of a person's emotional or mental impairment. To qualify for an Emotional Support Animal (ESA), you'll need a properly written letter from a licensed therapist or medical doctor that prescribes an ESA due to an emotional or psychological disability found in the Diagnostic and Statistical Manual of Mental Disorders (DSM-5). An ESA may fly in the cabin of a commercial or private airline with their disabled handler, and the handler may NOT be charged a pet or other fee. Landlords and property managers must make reasonable accommodations for tenants or prospective tenants with ESAs, even if the apartment, house, college dorm, or other residence does not allow pets. A tenant with an ESA may NOT be charged a pet-fee of any kind, even if pet fees are normally required. With only a few exceptions, a disabled handler may take a service dog into any place a person without a dog would normally be allowed to go - even when pets are NOT allowed. This includes, but is not limited to: restaurants, grocery stores, malls, theatres, buses, taxis, trains, airplanes, motels, government buildings, medical offices, hospitals, parks, beaches, amusement parks, churches, etc. Landlords and property managers must make reasonable accommodations for tenants or prospective tenants with service dogs, even if the apartment, house, college dorm, or other residence does not allow pets. 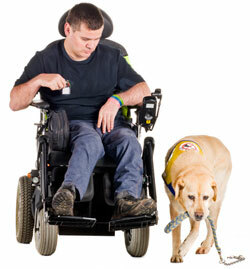 A tenant with a service dog may NOT be charged a pet-fee of any kind, even if pet fees are normally required. Public entities may NOT charge the disabled handler a fee because of their service dog. Public entities may NOT position or seat the handler and service dog away from other patrons to intentionally separate them.